This deluxe escorted tour of a lifetime will take you through some of western North America’s most impressive scenery, kicking off in beautiful Vancouver, British Columbia before heading into the majestic Canadian Rockies and across the Continental Divide, where the endless soaring jagged peaks and vivid aquamarine-hued lakes look as if they could only be found in a dream. 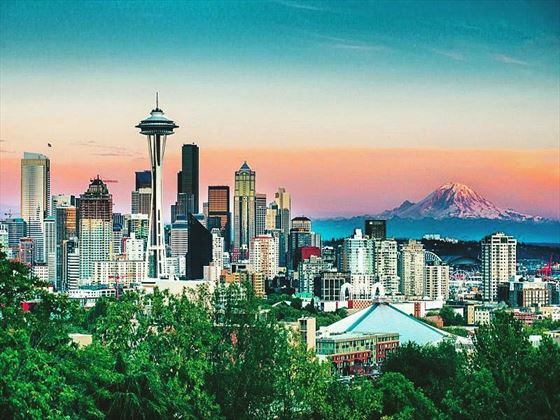 You’ll venture across the border, into the U.S. and the stunning Pacific Northwest, where more unspoiled wilderness and scenic splendour awaits, before capping off this truly grand adventure in the cosmopolitan city of Seattle. 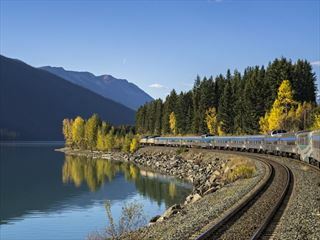 Ride the rails across the Continental Divide, spending the night in your Sleeper Plus rail car and waking up to some of the most glorious views on the planet. 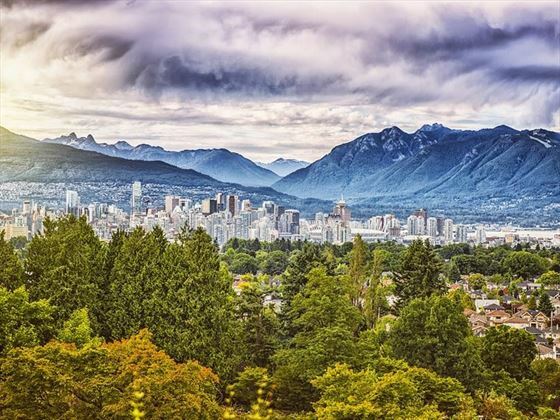 Welcome to Vancouver, a gorgeous city where the ocean meets dramatic mountains and is filled with grand parks, lush forests, lively pubs, outstanding shopping, world-class restaurants and museums. Upon arrival, relax or doing a little exploring at your leisure before enjoying a special welcome dinner to kick off your tour, including time mingling over wine. In the morning, take a tour of Vancouver, exploring Gastown, Chinatown and English Bay, plus the famous totem poles in Stanley Park. Next, you’ll hop aboard a ferry, sailing through the picturesque Gulf Islands to Vancouver Island, where along the way you’re likely to catch one of the daily orca whale shows, with the aquatic acrobats happily dancing in and out of the glistening waters regularly in this area. 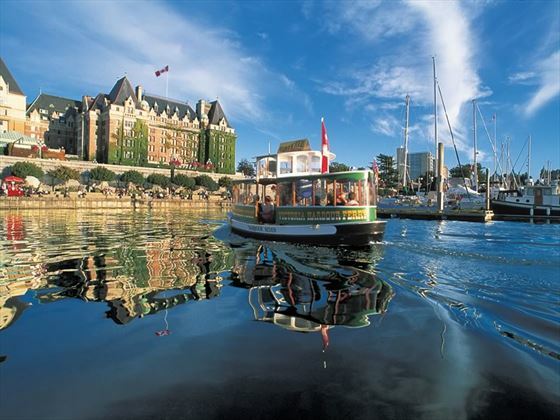 Afterward, enjoy a scenic drive to your destination for the next two nights: Victoria, the spectacular capital city of British Columbia. In the morning, explore Butchart Gardens, considered one of the best display gardens in the world, with some 700 varieties of plants in bloom from March to October. You won’t want to miss taking a sightseeing tour either, which includes many of the city’s other highlights, like the luxurious Uplands, the oldest Chinatown in Canada, the stately legislative buildings and the Inner Harbour. End your time in Victoria with a Highlight Dinner at Canoe Brewpub Marina and Restaurant, paired with homemade seasonal brews on the waterfront. Return to the mainland with a cruise to the North Shore of Vancouver and a short drive into the mountains for a heart-pounding walk on the Capilano Suspension Bridge. Dangling high above the roaring Capilano River, you’ll get a unique perspective of some of Mother Nature’s most stunning offerings in this cedar-scented rainforest. Enjoy a highlight dinner, toasting to your time in this corner of the world with a local craft beer or B.C. 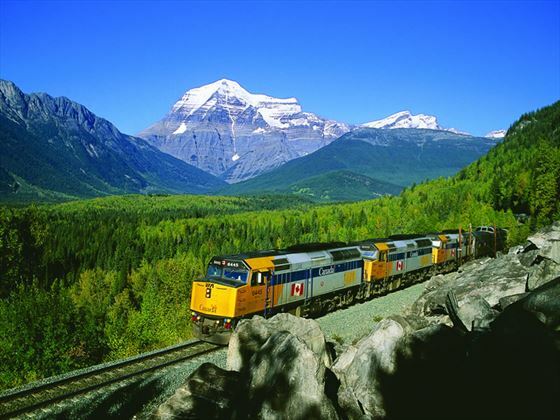 wine with a meal overlooking the brilliant gardens of Stanley Park before riding the rails in an overnight adventure into the Canadian Rockies, while you relax in your Sleeper Plus Via Rail car. 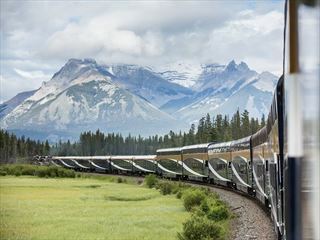 Wake up to awe-inspiring vistas, rolling past some of the most magnificent scenery on the planet, including the soaring limestone peaks, sparkling lakes and glaciers across the Continental Divide. 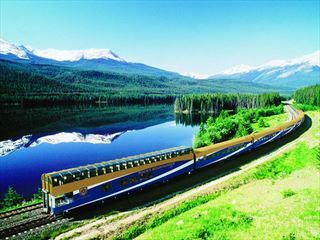 In the afternoon, you’ll arrive at your next destination: Jasper National Park, tucked in the heart of the Canadian Rockies, where you’ll find mineral hot springs, rugged glaciers, colourful meadows and majestic mountains. After a night of rest, you’ll have a full day to explore the park, starting out with an informative walk along the Maligne Canyon trails, marvelling at the rock formations, waterfalls and the powerfully churning waters while getting a fascinating geology lesson through the interpretive displays. 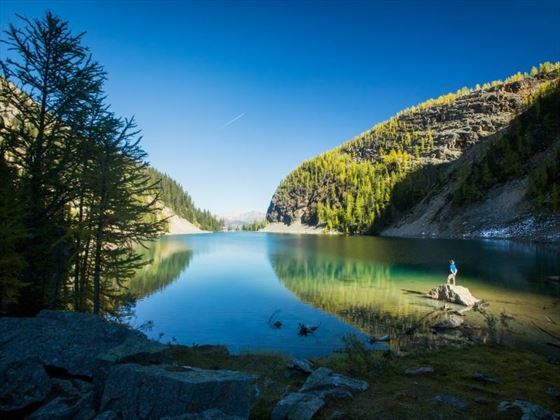 Give your feet a break by embarking on what’s been called Canada’s best boat cruise across the glacial waters of one of the Rockies’ crown jewels, Maligne Lake, where you’ll make a stop at Spirit Island, known for its myths and legends, including a Romeo & Juliet-style tale. It’s time to head to Banff National Park by following the sublime Icefields Parkway, which will reveal the spectacular grandeur of the Athabasca Glacier, the largest of the six “toes” that make up the Columbia Icefield. At the Icefields Visitor Center, you can even take an unforgettable excursion onto the surface of the glacier and step out onto the accessible tongue of ice that squeezes into a valley below, something that was formed thousands of years ago. Warm up afterward at the elegant Chateau Lake Louise before moving on to your final destination for the next two nights: Banff National Park. Enjoy a relaxing morning followed by a day at leisure. You can choose to either explore on your own or join an optional tour, whether it’s taking in a bird’s-eye view of the landscape via helicopter tour, or a ride on the Banff Gondola. In the village of Banff, you’ll have the chance to fuel your appetite at one of a number of local eateries, with a “Dine Around” evening, before retiring for the night. Travelling south toward the U.S. border, where the foothills of the Rockies meet the Great Plains, you’ll discover one of the oldest, largest and most well-preserved buffalo jumps, which bears witness to a type of hunting practiced by native people in this region for nearly 6,000 years. 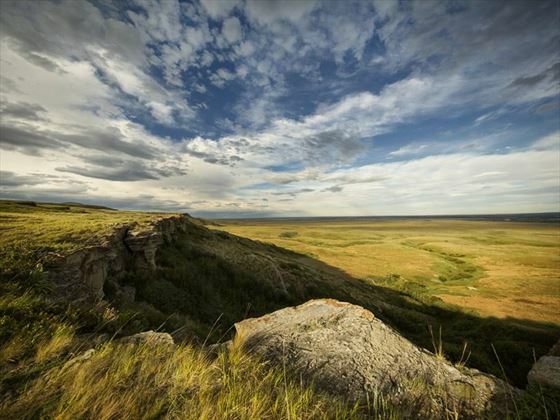 At “Head Smashed in Buffalo Jump”, a UNESCO World Heritage site, you’ll find out how they used the cliff to hunt the stampeding herds of bison, and even hear tales told by a local Blackfoot elder about the Plains people before crossing the border into Montana, and into glorious Glacier National Park. Today you’ll embark on one of the world’s most breath-taking drives via a private, historic Red Jammer bus, restored originals that have been touring passengers since the 1930s. The narrated trip includes views of cedar forests, intensely blue glacial lakes, waterfalls and an abundance of wildlife, including the bighorn sheep and mountain goats that often hang out at Logan Pass, soaking up the sun along the roadway. The adventure ends at the park’s most famous, and largest, lake, glacier-fed Lake McDonald with peaks of the Continental Divide at its head. 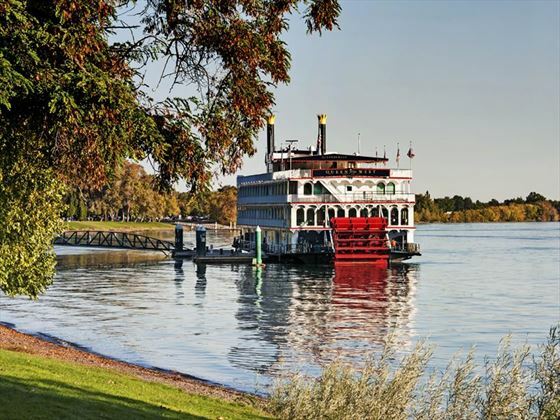 Heading west toward the Evergreen State, stop at one of the most pristine lakes in the country, Lake Couer d’Alene, with deep blue waters that span 25 miles, and bald eagles can often be seen perched in the trees or soaring overhead. Just over the border in Spokane, Washington, you’ll reach your destination for the night: the Historic Davenport Hotel, which opened over a century ago, playing home to a countless number of Hollywood stars, writers, explores, politicians and other luminaries, including Amelia Earhart and Charles Lindbergh, Clark Gable, Mary Pickford and Bob Hope. The day also includes a Highlight Dinner at the award-winning brewery Steam Plant, set within a nationally recognised historic building. Continuing west through the wide open spaces of eastern Washington and onto the vineyards in the state’s top wine-producing area, take a break at the award-winning boutique winery Cave B Estate for lunch paired with wine tastings. Afterward, you’ll traverse over the magnificent Cascade Mountain Range and into Seattle to enjoy some relaxation after your long drive. Begin your day exploring the Emerald City with a sightseeing tour that will take you through many of Seattle’s most beloved sights, like the iconic Space Needle where you can ride the elevator to the top for astounding panoramic views of the city, the Sound, and, if the weather cooperates, Mount Rainier, the Olympic and Cascade Mountains. You’ll also explore Pioneer Square, Seattle’s original downtown area, and one of its most interesting neighbourhoods, as well as famous Pike Place Market, where you can watch fishmongers toss the fresh catch of the day and shop for local goods. 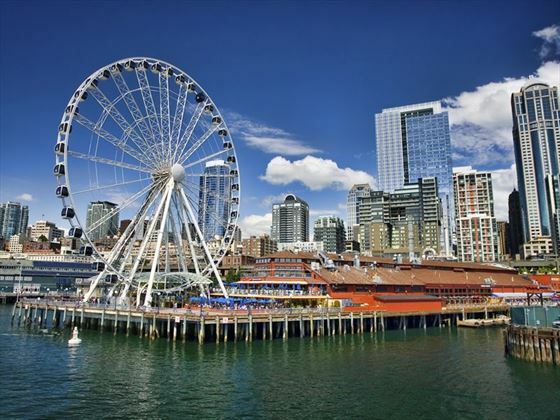 Spend the afternoon experiencing places like Chihuly Garden and Glass exhibits, the Seattle Art Museum and the waterfront before indulging in what’s been called the best clam chowder in the world at Ivar's Acres of Clams on Pier 54 overlooking Elliott Bay in a special Celebration Dinner. It’s time to end your amazing journey today, with a flight out of SeaTac International Airport or Vancouver International Airport. Early Booking Offer Book and pay for your 2019 tour by 30 Apr and save up to €390pp Discounts included in advertised prices. Start your journey in the cosmopolitan city of Vancouver before you embark on an amazing 7 night Alaskan Cruise on Celebrity Infinity. 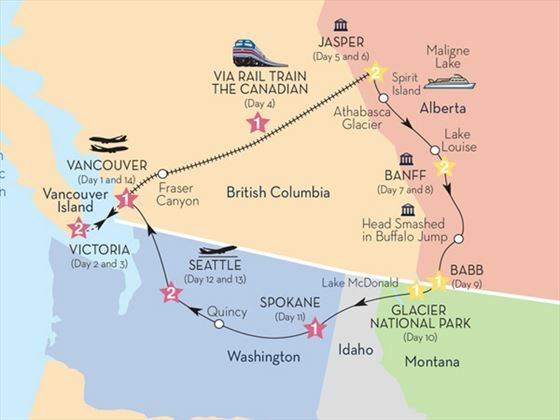 After your Alaskan cruise you have two more nights in Vancouver, 2 days on the Rocky Mountaineer and stays in Kamloops, Jasper and Banff.